This Interview with Naw A--- describes her husband’s killing, which occurred in Paingkyon Township, Hpa-an District, on April 19th 2016, and includes her concerns about her family’s security. 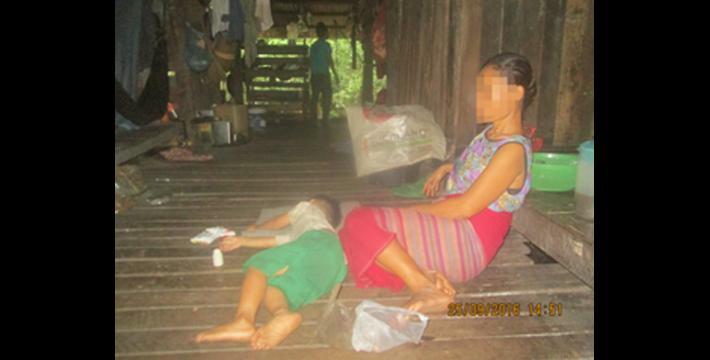 Naw A---, who lives in B--- village, Taw Soe village tract, Paingkyon Township, Hpa-an District, describes how her husband was murdered by other villagers on April 19th 2016 after they suspected him of practicing witchcraft. There are no authorities investigating this killing case and the victim’s family is too afraid to report it. People in the village told Naw A---‘s family that if they reported the case, they would be killed. The following Interview was conducted by a community member trained by KHRG to monitor local human rights conditions. It was conducted in Hpa-an District on September 25th 2016 and is presented below translated exactly as it was received, save for minor edits for clarity and security. This interview was received along with other information from Hpa-an District, including two other interviews and 35 photographs. People call me Naw A---. In which village tract and township is B--- village located? It is located in Taw Soe village tract, Ta Kreh [Paingkyon] Township. Maybe you work on something [for your livelihood]. I only work on a farm. I do not know much about working on a farm because he [my husband] did it [for us] when he was alive. I would like to know if you have experienced anything while living in this village that has upset you? There was only my husband’s case. Could you tell me what happened to him? I did not know anything [about why he was killed] until after he was killed by those people. After he was killed, people told me that he put things [witchcraft materials] under villagers’ houses. He put things under Mu D---’s house, Naw E---’s house, Saw F---’s house, Naw G---’s house and Naw H---’s house. What materials did he place [under peoples’ houses]? They said that he buried a piece of red cloth, almost one fingertip to elbow deep (18 inches), under Mu D---’s house, a charcoal used in cremation under Naw E---’s house, and beside Saw F---’s house posts and under Naw G---’s house he buried seven voodoo dolls and stones that were cursed by witchcraft. Please describe your husband’s past, when he was alive? When he was alive he never told us about this [admitted to us that he could do witchcraft], and I did not know anything about it. People told us [he could do witchcraft] after he was murdered. We never knew about this when he was alive. So, you are saying that people accused him of practicing witchcraft, right? People told [me] that he could do witchcraft and that he was malicious to everyone, including his wife and his children. How long had you lived with your husband? It had been almost twenty years. Did you ever see him doing suspicious work [witchcraft]? That is good. When was your husband killed by those people? It was on Talah [Karen month for March and April] 2, 2016 [or April 9th 2016 if according to the Burmese calendar]. People accused him of practicing witchcraft and then they killed him, so do you know who killed him in secret? I do not know. While I was hiding, I heard people say, “If we shoot him by gun, the gun will not fire out. If we hack or stab him with a knife, then he will not get injured. We cannot grab him or tie him up with string. Even if we can arrest him, we will not be able to tie him [because he is a witch]”. We [myself and my children] had never heard him say he could do witchcraft. Other people said they heard him [my husband] tell them that [he could not be killed or captured]. [They said] he told them this while he was in other people’s houses. They [people in the village] said he told them that he could do witchcraft. For me, I did not know anything [about the rumours that my husband could do witchcraft]. People told me about it after he was killed. Did people tell you about how your husband died? People said, “He could do witchcraft, so his wife can do it too. Her husband would have taught her [how to do witchcraft]”. They spoke in secret and said if anything happens [in court] and if I report this [that they killed my husband] to someone [the authorities], then they would kill all [of my family members], and they would not leave anyone left. Regarding how you have spoken about this case, it seems you might know who the killers are. Hmmm.. I might know. Saw I--- said my husband ordered people to steal his younger brother’s motorcycle while he looked after his younger sister in the hospital. The hospital is in Kru Tu [Town] and my husband was at home [in the village], so how would he know [about his brother’s motorcycle]? He would not know [about] it. I think you know who the killers are. After my husband died, [a villager] told me, “Do not phone any of his [my husband’s] siblings because his siblings can also do witchcraft. Therefore, we will clear [kill] all of them if you contact them and if they come here”. This was Saw I--- himself who said this. Do you think the killers are villagers or soldiers? They are villagers, not soldiers. Could you provide information about how he was killed? That night, my son and my husband were watching a movie at Pu J---’s house. [I was told that] someone asked them to turn off the video, so the children in the house did it. After, he told our son, “Son!! Let’s go home because people will not let us keep the television on anymore”. Regarding what people told me about my husband, it is likely he did not know anything [about people’s plans to kill him], so he [and our son] came back [home]. My son said people arrested him [his father] when they [he and our son] arrived beside Uncle Saw K---’s water well. I ran to my son when I heard him crying because I thought he was bit by a dog. Before I reached my son, I heard my husband scream for me to come help him, “Naw Moe! Help me, Naw Moe! Help me!” I went out with a torch light, so I could see, and I saw people strangling his neck and squeezing his nose [suffocating him]. Therefore, I rushed to those people [who were killing my husband]. Then my younger brother tried to stop me, but I was still able to reach two of the killers who were holding my husband and pushed them away. I could not see those killers’ faces. I only saw their hands [restraining my husband]. Then some other people stopped me and others caught him [my husband] and then they separated him from me, and they did not let us see each other anymore. Did those people take him away? They took him away and killed him. [Before he was murdered] I begged my younger brother to let me see him again. When I went there [to where they were holding him], I could only see the killers’ legs and could not see their faces because they were hidden behind a walking tractor, so I did not know who [the killers] were. People asked me [who murdered my husband], but I did not know who the killers were. Later on, I heard people [villagers] say that if we try to ask [other people about who the killers were] then they would know who beat him [killed my husband]. And so I asked them [villagers], “Who knows who the killers are?” One of the villagers said, “The person who hit your husband was Saw L--- because they [he and his friends] said if people shot him [my husband] by gun then the gun would not fire out, and if people hacked or stabbed him with a knife, he would not get injured.” In my [experience], I had never heard him say that [he could do witchcraft]. That person’s name is Saw L---, right? Yes. But I do not know if someone ordered him [to kill my husband] or not. Is [Saw L---] a man? Yes. He is Saw M---’s younger brother. Did you reach [your husband] just before he was killed? Yes. I reached him when he was calling out to me and he was not dead yet, but people took me away. When people were holding me for a while [several minutes], I tried to shake myself free. Then people slapped my face, and my younger brother also slapped my face and strangled my neck. My brother told me, “It is not only villagers committing the killing, soldiers are also involved.” Later, I heard that it [this killing case] did not involve soldiers. Did you have a chance to bury your husband? No. I could not bury him because after they took him away from me, they took me to my house and then they did not allow me to go [and see him] again. Do you know where your husband’s grave is? I do not even know where they keep his body. I asked Saw M--- [about my husband’s grave] and he said he knew the place because he followed those people [the people who killed my husband there]. While the mob of killers tried to kill my husband, he was in N--- village but he heard noises from the killers. Then he [Saw M---] told his nephew to come and stay at home with his mother [and went to follow the noise]. I thought he would know some [information about this killing case] because he took a ring from my husband’s finger [after he was killed]. People told him to throw it away, but he did not do it and he just kept it. [Actually,] this ring was not my husband’s ring. [One day] Naw O--- gave me this ring, but it did not fit my finger so my husband told me, “Let me try it on and see if it will fit my finger or not”. Then he wore it and it fit his finger. Before he wore this ring, the ring was not this light golden colour, but it turned into a light gold colour after he wore it. People [unknown] said there were words and voodoo engraved [on the surface of the ring] that were cursed by witchcraft, but I did not check when I got it because I am not educated and would not be able to recognise [what was on the ring]. I asked Saw M--- about this ring and he replied to me, and said, “There were words and voodoo dolls cursed by witchcraft that were engraved inside the ring and looked like the shape of a flower”. I just thought the people who had made the ring put a flower on the ring. Since I got it, I had never checked this ring. They [the people who killed my husband] were going to bury this ring with my husband, but Saw M--- did not agree with them. Then he took the ring off my husband’s finger. I asked Saw M--- about this ring and he said he kept it. So you have not seen his grave yet, right? Do people [your surrounding neighbours and villagers] still keep their eyes on you and watch you closely after your husband was murdered? People always keep their eyes on me and watch me closely, and even just yesterday, people questioned me [about what I did to follow up my husband case]. When I went to my younger brother’s house this morning, his wife asked me too [about what I answered when people asked me about my husband case]. I replied to her, “I did not say anything about it [killing case] to anyone who did not ask me, but I told everyone who met with me and asked me about this case.” Naw E--- told me, “If people ask you for information [about your husband’s case] and if you do not know it, then just tell them ‘if you want to know information [about the killing], just go to the people who committed the killing and ask them [for information]”. They said this to me because they heard that this case would go [to court], so they questioned me about it [if I reported something to local authorities]. However, I told them, “I did not report anything [to authorities], and I only answered people who asked me [about my husband’s murder].” I did not report this case directly to [the authorities]. I told them, “If you do not believe me, just come and ask you [KHRG researcher]. When I was selling fish [at C--- village], I went with Kyaw P---. I arrived to his [KHRG researcher’s] house and met with him and he asked me for information [about my husband’s death]”. I will wait and see it if they dare to come to you [researcher] or not. They said, “If this [killing] case comes out, we will have to go [to the court] because we committed the crime.” They know, themselves, that they committed the crime. They told me if they had to go [to court], then I would have to go with them. I replied and told them that if I have to go with them, then I will go. Is there anyone who does not believe that your husband could do witchcraft? Yes, there are a lot of people who do not believe that he could do that [witchcraft]. They told me that my husband could not do it [witchcraft] because he had lived here [B--- village] for many years and they never saw that he could do it. He lived with me for many years and if he could do it [witchcraft], I would know it. They [perpetrators] said they saw my husband do it in secret, but his nephews and nieces never saw him practicing witchcraft when he was in his own village. His nephews and nieces were raised by him. They want to come here [this village], so they told me to ask you [KHRG researcher] if they can come or not. If they can come here, they would like to meet with you too. Yes, I want to know the exact information too. We will confirm everything [the situation and security] and then I will respond to the people who want to come here. People in my village said he told other people that he could do witchcraft and he used witchcraft to kill almost a hundred people in his village. I asked his nephews and nieces who were raised by him about it, but they said they had never heard this. His village name is Q--- village. Where is Q--- village located? Is it far from here? Yes, it is very far from here. Q--- village is located in part of R--- village. People said he used witchcraft to kill a hundred people in his village, so did he dare to visit his village? Yes, he visited his village with me and we sometimes stayed there for a week or a month at a time. He always went back to his village when he was alive. Actually, he had a plan to go back to his village this week because his younger brother told him to go back for the ceremony to celebrate the stupas’ finial [ornament at the top of a stupa], so I thought I would visit his village with him after our son sent money to us. Unfortunately, he was murdered before he went back to his village. People said he killed people in his village by witchcraft, but he always visited his own village once or twice per year, right? Yes, he always went back to his village once or twice per year. Did people in his village say that [he could do witchcraft]? No, they never said that. People in his village had never heard that he could do it. There were a lot of people [in his village] who were nice to me. So the only people who said that [he practiced witchcraft] are those people [from your village] right? They [the people involved from my village] were the only people [who said that]. Other people did not say this. His nephews and nieces also spoke highly of him. When I phoned his nephews and nieces I asked them, “Did your uncle do [witchcraft]? When he lived in your village, had you ever heard that he could do witchcraft? You can tell me what he did because people from here [my village] said that he could kill people by witchcraft. They gossip about this case behind my back and it is making me uncomfortable since my husband is now gone forever”. They replied to me that they had never heard [that my husband could do witchcraft]. They said, “Our uncle had looked after cows since he was a child until we grew up. People even asked him to blow and start a fire, but he could not do it well, so how could he do witchcraft? Therefore, we do not believe it. Why did they [people who accused our uncle] not inform his siblings to come [to the village] before they killed him? If they told us in advance, we would have come and spoken on his behalf. Even if we had to sign an agreement, we could do that too”. They killed him, but his relatives did not know because nobody informed them. People killed your husband because they suspected that he could kill people by witchcraft. Regarding what you have said, he did not do anything bad in this village. Had he ever argued or fought with any people in this village when he was alive? In our arguments, I always told him everything I wanted to. No, I mean to other villagers. Sometimes people argued with him, so he responded back to them. What issues did they argue about? Later on, Saw F--- rented this farm [from Pa Dtee V--- ] to work on. One time, Saw F---’s goats came to my husband’s [vegetable] fence and he [my husband] made sounds by clapping his hands and shaking his legs, which made Saw F---’s goats run away when they heard the sound. After that, his pregnant goat had a miscarriage. Saw F--- angrily reported this issue [to the authorities] and said that my husband shot his pregnant goat [with a sling shot]. My husband and I just looked at their [Saw F---’s and authorities’] faces without saying anything to them. Also, when Saw F--- and his children would argue with each other, he would say that my husband made them argue with each other by using his witchcraft. [However,] my husband stayed at home and he did not know anything. My husband just said “Hmmm! Kwa [cousin] Saw F--- is arguing with his children again.” I had never heard about this [accusations that my husband made their family argue with each other] before. I only heard it after my husband was killed. They [gossipers] said they did not dare to talk to me about it frankly when my husband alive. I replied to them, “Why did you not say this to his wife [me] when he was still alive, and you could still come and tell me? If you told me, I would have told my husband and taught him moral values and what is right and wrong.” They said, “We did not dare to talk about it because we were afraid that this information [witchcraft] would spread [to the authorities].” However, they dared to do it [kill my husband] in secret. They said they did it openly, and everyone knew it [but I did not know who killed my husband]. If they said everyone knew it, why did they try to control you and not allow you to travel or tell information to other people? Yes, they said this. They made me drink promissory water [for not spreading information about my husband’ case]. They told me that if information about the case spreads, it would be because his wife [spread information about the case]. She [unknown name] said, “Teaching [someone] how to do witchcraft is like making a snack that our husbands cannot make. Later on, we will teach them and then they will know how to make it [the snack]. As her husband could do witchcraft, she can do it too and I will not believe her even if she says she cannot do it. Her husband had to have taught her.” However, if my husband could do witchcraft and if he taught me [how to do witchcraft], I would still not be able to do it because I do not know any letters [I cannot read and write]. I cannot even recognise the words or pictures of witchcraft. I do not know how to write words or how to draw a picture because I have never gone to school, not even when I was a child. If I had been to school, it might be possible that I could learn it, but I have never learned how to draw a picture [so it is impossible]. I told them that I do not have any knowledge about witchcraft and I let them check [everything in my house]. They checked all of my husband’s belongings and then they burnt them. They accused me of telling other people that I was not allowed to plan my husband’s funeral. I told them I never said that. I spoke to the married woman [unknown] I had met at a shop last time about how people accused me of telling her about the funeral issue. I asked her, “I heard people say you [the married woman] said this [that I said other people did not allow me to plan my husband’s funeral].” And I said, “[Last time we met] we were buying things and only discussed other issues.” She said, “Yes, it is [true] that I did not ask you anything about this issue [about the funeral].” I replied her, “Yes mu ghar,  you did not ask me anything [about the funeral] and I never told you about his killing case either. People [gossipers] said ‘I told you that people did not allow me to plan for my husband’s funeral.’ I could show you the place where they told me, it was in the area underneath the house.” I asked her, “Did I tell you this information?” She said, “You did not tell me any of this [when we met last time]. They [the people involved in the killing case] did not dare to tell me [that I had discussed the murder case] and they told my children, so my children scolded me.” She continued, “If this case comes out [to court], it will not involve any people from N--- village because they [N--- villagers] already said none of them were involved in this case.” This aunty told me like this. One of my husband’s grandchildren, who is the child of his nephew, came to the village and asked aunty Kyaw W---,“Aunty, do you know how my uncle is?” She replied to my husband’s grandchild, “He passed way.” Then they did not ask anything about how their grandfather had died. The aunty [Kyaw W---] said later she heard people say that my husband’s grandchild questioned Saw L--- and Saw M--- [about their grandfather’s death]. She said his grandchild did not know Saw L--- and Saw M---, so they could not question them. I asked other people [about the grandchild asking questions] but nobody saw it or knew about it. I asked her, “Who told you [about the grandchild], aunty?” She said she did not know or remember the people who said it. I think, if this grandchild knew [this information], they would have already phoned and informed his relatives in X--- village and Y--- village. Then his relatives would have informed other relatives [from other villages] because these villages are not far from here. All of my husband’s relatives would have known the situation of his death because some of his grandchildren live in Q--- village. My husband’s father is from Z--- village and he had a lot of relatives, nephews and nieces in X--- village and Y--- village. My husband is one of four children, with two older brothers and one younger brother. Regarding your husband’s death, do all of your husband’s siblings and relatives know about it yet? As you previously mentioned Saw M---’s sisters, what is his younger sister’s and his older brother wife’s name? Saw M---’s younger sister’s name is Naw G--- and his older brother’s wife’s name is Naw Aa---. My brother defended me [that I could not do witchcraft and that I would not report the case], but then Naw E--- and Saw I--- themselves said that if this case is reported to the court, then my brother has to kill me and my two sons. How is this case related to these women? Naw E--- ordered people [some of those involved in the killing] to arrest my son and take him to her when my son was shouting and while other people were killing my husband. She was holding a piece of wood and she was going to strike my son and she was going to kill my son herself. When my children went to fish, Saw I--- said they went around his house. I asked my children [about this] and they replied to me, “His house is on our way to our fishing place, so we went across his house and returned across his house with fish.” That night [when they asked my children about it] my children were in fear, and afraid of them so they [my children] had to accept everything that they accused them of [my children]. Don’t you [KHRG researcher] see how they threatened my children? My son would have been murdered together with his father that night if her [Naw E---’s] father did not see it. She was going to strike him until he was dead. She is evil and thin. I looked for Thara [a healer] for her when she was sick but she did not remember that I had done a good thing for her. After he [Pu Ka Nah Pa] passed away, they said Pu Ka Nah Pa and my husband were [doing] the same thing [witchcraft] and then I did not allow my husband to go to his house anymore. When he was alive he visited us. He was nice to us. We liked him and we loved him. I cooked food for him. My husband bought bottles of beer and they drank together. Both my husband and Pu Ka Nah Pa loved playing lottery. After Pu Ka Nah Pa passed away, people said he could do witchcraft, so I did not allow my husband to go to his house because [I heard] people said that if my husband went to Pu Ka Nah Pa’s house, they would arrest him on his way and then they would hang him from the tree and would say that he had hanged himself [suicide]. Do you think that this is just? Saw F--- and Naw Aa---. Are they the people who you mentioned before? They hid this information, so they did not want me to go to C---village because they were afraid that man [KHRG researcher] would know about [the case]. They were [also] afraid that if my youngest son, who always followed me, would hear about how his father was murdered, then he would take revenge one day when he was older. Do you think they like my children? They hate my youngest son. They did not dare to say this openly and directly to me, but instead told my [older] son and then he let me know about this. My older son said to me, “Mom! You should not visit other people houses. If you do, my younger brother might hear the case and when he grows up he might do something back to those people who murdered his father.” They [those involved in the murder] are afraid the houses [other people] that I visit will serve rice and snacks to my youngest son, and they will tell him this information [about the murder case] and they will teach him [to do something back to the people who killed his father]. Now you see? As he is just a child, he does not know that some people dislike him. Yes, he is just a child, so he does not know it. They said if the case goes to court, there will be no one on my side. I do not care if they are against me, as my husband’s friend, Kyaw Dd---’s mother knew him very well and knew that he could not do witchcraft. She said, “When he [husband] stayed [worked] for me, I sometimes treated him badly and cursed him. I asked him to do many things such as clean the vegetation in the rubber plantation, and plough the land to make the land surface smooth so I could build a house. If he could kill people by doing witchcraft, he would have killed me already. I told him everything what I wanted to say.” Then she said, “He could not do witchcraft. If his siblings come, I advise you to explain this case to them and I will be on your side.” His nephews and nieces phoned me and they also want to talk with you [KHRG researcher]. They want to ask about coming to visit [my village]. Which authority do you prefer [to handle] your husband’s murder case? I do not dare to do anything [to report the case] since I am afraid of my neighbours. However, my husband’s family members will do something to get justice for him. They [villagers involved in the murder] threatened me that if I report my husband case, I would not have any food to eat. They said I would not be able to buy a basket of rice, even if my son from Bangkok sent me money, it would be because I gave money to my older sister to help me get justice for my husband case. Actually, I gave money to my older sister because her daughter, who studies in a refugee camp, asked my son to send two thousand baht for her. My son sent money to me in Burmese currency, so I asked Kyaw Dd---‘s mother whether she had any Thai currency with her, and if she had it, I would ask her to exchange it for me. She replied, “Don’t worry, I will give it to Naw Ee--- [her friend] when I reach Myawaddy town.” Then I gave it to her. What kind of job did they accuse you of paying someone in this village to do for you? They accused me that I asked them to report my husband’s case [to the court]. Pay people to resolve this case for you, right? Yes, it is. I did not ask people to do anything to [solve] my husband’s murder case. Sometimes my son [who works in Bangkok] told me, “Mom if you get money, let grandma use some.” Therefore, I gave some money to my mother. I always give some money to my mother when I receive money from my daily labour and from my son. I sometimes buy snacks and milk for my mother too. Are you able to travel freely now? Not yet. Wherever I travel, people always suspect me [of spreading information], keep their eyes on me, and they still gossip about me behind my back. If you return back to your village, do you think they will ask you why you were in this village [C--- village]? After I returned from C--- Village, I explained everything to my sister. I even heard they [perpetrators] whispering and gossiping about it [me coming to speak with KHRG researcher] beside my younger sister’s house. I told [them], “If you want to know what I am doing regarding my husband’s case, just come and ask me. I will explain everything to you. I did not report anything to the court, but I answered everyone who asked me [about my husband’s murder case]. I did not know who beat [murdered] my husband and I just heard rumours while I was travelling”. I asked them back, “What are you hiding from me?” They replied, “We are not hiding anything.” I told them that someone might be hiding something from me. They suspiciously asked me, “Where did you hear about this issue and who told you about this?” I replied, “I heard it from the people [my neighbours]. When you [gossipers] heard something you did not mention their names, so I will not call out their names.” I told them to ask themselves, who is hiding information about my husband’s murdered case? They might ask each other after I leave. I met with them when I was taking a bath in the river. They spoke with me, but their faces were still full of suspicion and unfriendliness. They were gossiping about me even when they were arguing with their children and when they were taking a bath in the river. I heard them say they hated me, but I just pretended like I did not hear anything and I walked past them. I can show you the location where they were gossiping about me. They even asked me if I reported my husband’s murder case to anyone. I told them, whoever asks me about my husband case I answer them [and tell them] as much as I know. They told me to reply to whoever asks me [about my husband murdered case] by saying “If you want to know about this murder case, go and ask to the people who committed the murder.” I heard gossipers talking about the killers, but I do not know exactly who committed the crime and who the leader of those killers is. Mu D--- and Naw E--- did not talk to each other much before, but since my husband was murdered they always visit each other. They [perpetrators and my neighbours] did not eat my food when I shared it with them, but I did not tell them anything and I was not angry and did not hate them. I ate their food when they shared it with me. My children asked me, “Mother! People do not eat your food, but why did you call [share food with] them?” My children said this to me like this because they know that the people involved in my husband’s murder case did not dare to eat my food. Since then, when I have vegetables or food I have not shared with them. They [people in the village] have not entered into my house since they built the house for me [a long time ago]. They came beside my house and spoke to me, but they have not entered into my house because they believe that my ladder is evil because it was made by my husband when he was still alive, so they said my ladder is not good for the people to climb on it. Only my younger sister has come into my house. If it [the ladder] was good or not [I do not know because] I have to use this ladder since I do not have anyone to build a new one for me. They [gossipers] told me that they dreamt that [my husband] did witchcraft to the ladder, but I did not know and I have never dreamt that. I just dreamt that he [my husband] came back [to the house], but he did not say anything. They said they dreamt that he [my husband] followed my younger brother and he tried to stab him. They told me that sometimes people saw him [my husband] alive here, so I should go [to the monk] and offer rice [breakfast or lunch] to the monk and then ask the monk to call out his name, so that he would go back [to the death world]. They did not allow me to plan my husband’s funeral, but they asked me to do this at the monastery, so I think I will not do it because they did not tell me where my husband was buried. If his siblings want to do it for him, they can do it [but I won’t do it]. Were they [people who asked you to go to the monastery for your husband] unpleasant? Yes, they were unpleasant. Firstly, they told me, “You can only plan the funeral if all villagers participate. Otherwise do not plan a funeral [for him. ]” They will not go to the monastery for my husband, so I won’t go. They [perpetrators] said, “If his [my husband’s] nieces and nephews report it to any [authority] and if they call them [to the court], then all of the villagers [from B--- village] will go with them to the court [to report] that they are not guilty.” Let’s wait and see if this case goes to the court, if all of the villagers [from B--- village] will go or not. Then, if the authorities ask them [villagers who were not involved in the killing case] to compensate my husband’s life on their [the perpetrators’] behalf and if they are willing to pay it, then I think it will be fine [I don’t mind]. Now, they always keep their eyes on me and they said they will do [kill] all of us [my family]. I worry for my security and that they will plan to kill me when there are no people around. Yesterday, Saw M--- told his younger sister [Naw G---‘s mother], “You should stay in harmony and you should not gossip about other people. Now you gossiped and said a bad thing [against her] that people would do [kill] her, so she is scared now that she is in danger.” I am scared of this [that people will kill my family], but this morning he told me not to be afraid, as I still have my relatives and siblings [to look after me]. However, I heard them say that none of my relatives would care if anything happened to me. Why should I not be afraid of this [the possibility that people might kill me]? How do you want local authorities to solve this case for you? I want [local authorities] to explain everything carefully and solve the case effectively and clearly among villagers and myself. I can stay in the village peacefully after the case has been solved [by authorities]. I want people [authorities] to explain this case to every villager, so they will understand my husband’s case clearly. My husband’s siblings care about me and want me to be able to live peacefully. My husband’s nieces and nephews said, “We want our uncle’s wife and children to live in peace even though our uncle has passed away.” My husband’s siblings want to visit and support me, and they asked me to get permission from local authorities to come and visit me. They also want to know more about my husband’s murder case. I cannot live a peaceful life after my husband’s murder. Thanks for your detailed explanation. Do you have any other issues that you want to mention that I might not have covered? I would like to thank you for giving me your time and for explaining to me in detailed as much information as you know. Mu ghar is a familiar term of respect in S’gaw Karen attributed to an older woman that translates to “aunt,” but it does not necessarily signify any actual familial relationship.